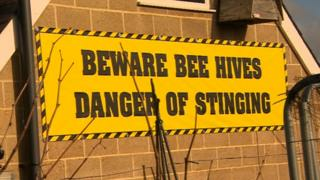 A beekeeper is warning new neighbours that they could face potentially lethal stings from his thousands of bees. Leigh Mordey has six hives housing up to 800,000 bees at his home in Medburn, Ponteland. He has told developer Bellway, which is building 62 executive homes, about a risk his bees might pose to future homeowners who experience allergies. Bellway said it was making sure it informed people "working and moving into the new development". Mr Mordey, who specialises in the native British black bee, said: "It just takes one sting if you're allergic to bee venom. "It's the same problem as nuts and shellfish; it could kill you within minutes." He has put up banners warning about the "dangers", but Northumberland County Council said he needed to apply for planning permission due to the size of the signs.